Two Unforgettable flower stalks, perched on a rocky hill edge, overlooking the verdant (OMG! green) northern border of Israel. I was determined to save my film for butterflies, but c’mon, how could I not succumb to this temptation? March 2015 in the Golan Heights region of Israel. A wet winter insured the arrival of a Spring with flowers blanketing the land, and rare wildflowers determined to capitalize on the excellent growing conditions. 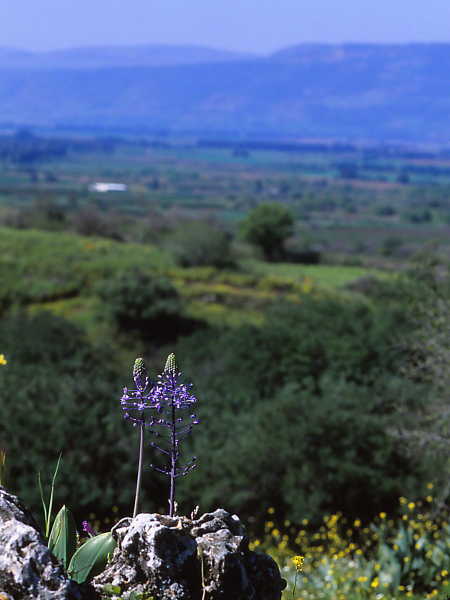 These Hyacinth Squill blooms (Scilla Hyacinthoides) dotted the sides of these hills, on the SPNI Hermon Reserve. They enjoy a short growing season, and are listed as a Protected Species. The expanse of view looks to the northwest, into Lebanon. Lebanon, a country wracked with violence. A pastoral view then, with bad-boy land to the horizon. Yes, this is primarily a butterfly blog, but . . . the camera made me do it! Captured Before the Russians, North Koreans, Hezbollah, Iranian Regulars/Irregulars, ISIL . . . I wanted images of the 2 Tarucus butterflies found in the HolyLand. I was in an SPNI field house in the Golan, and my plan was to drive south to a place I’d never been to, with no guidance other than the maps in an Israel field guide. The more than one hour drive skirted the eastern shore of the Sea of Galilee, past Capernum, to scout out probable habitat for these black and white nifties. Found them! Here is Tarucus rosaceus, sweetly nectaring in a spot some 3/4 of a miles or so from the Syrian border. His markings are striking, and I was very happy that I made the effort to add Tarucus to my ‘I Really Want To Locate These Butterflies’ itinerary. I did stand there and marvel at how close I was to villainous, murderous demons, the Syrian butchers, the mercenary Russians and their high tech ‘toys,’ Iranian Thugs who call themselves the Iranian Guard, for hire North Korean Satans, ISIL monsters who kill and behead Christians and whomever else, Hezbollah Haters who train 7 days a week to kill Jews, Chinese technicians who are there to do what?, Hamas murderers and . . . All of them madmen less than a mile away, and there I am breaking my own rule, getting down on my belly to cop a shot of a tiny Tarucus butterfly (thus offering myself up to ticks, scorpions and Middle Eastern pit vipers-of the no known serum type). A grown man acting like a boy, all to catch a good look at G-d’s work. It’s the first week of September. That means that the search for butterflies now slows, and soon stops. 2018 has been a very interesting year. Travelled to New York State, Pennsylvania, the mountains, Piedmont and coast of Georgia. How’d I do with scoring new images? Good, though the ones that I tried for and didn’t capture, sure do irk. That day in Israel was such an experience. 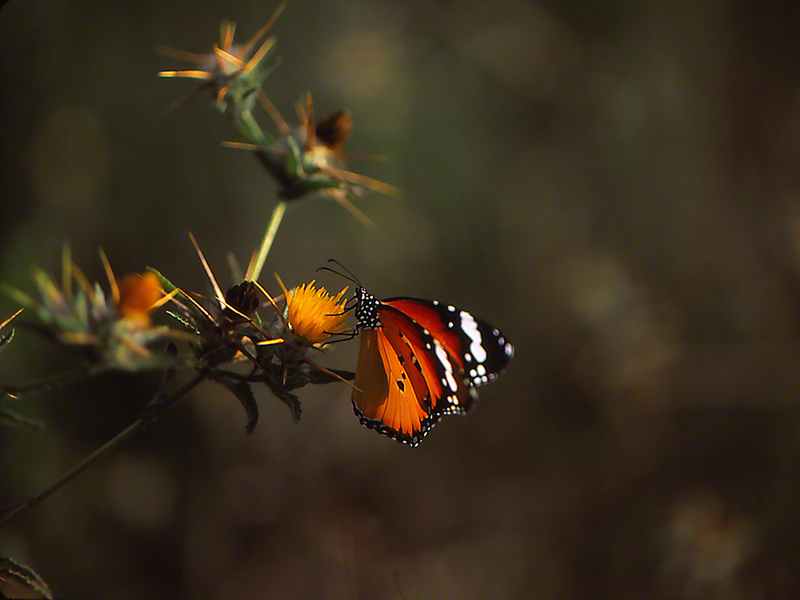 I booked a field house at the SPNI Golan, and that morning drive south, intent on seeing the tiny Tarucus butterflies. With no one to guide me, I chose a destination right near the Jordanian border. Breath-taking scenery greeted me, on that 1.5 hour drive, especially the eastern coast of the Sea of Galilee, familiar to most, back in those Sunday school classes. Dark clouds and intermittent sun followed me, nearly the entire time. I reached the intersection I targeted, on my map book of Israel. I parked my rental, and explored an abandoned park.. Jackpot! I found and photo’d Tarucus rosaceus. Tiny gems they, found in many places along Israel’s eastern, southern and western edges. Nearly one hour after arriving in this spooky, deserted place, I spotted Tarucus balkanicus, shown here. I threw caution to the wind, and carefully got down on my stomach.He was handsome, tiny, but handsome. Fresh too! So . . . why the blurry image?? He did not flee when I got down to his level (2 inches above the trail). He stayed in place when I crawled closer. I prepared to take my first exposure . . . then . . . it came down in buckets,. This was my one and only lifetime picture of this HolyLand butterfly. He fled like a missile. Me? By the time I got myself up from the ground, I was SOAKED.